Our Award Winning, Club Mark Approved Junior Section trains every Monday and Tuesday. We are a thriving adult club with over 200 members, and an active Club Mark Accredited Junior Club with over 120 members. We run the popular Benfleet 15 and Kirste 5 Memorial Race, and celebrate our 25th Anniversary in 2015. 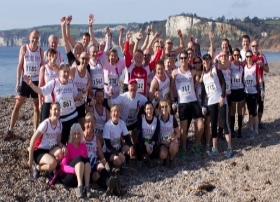 The club's main aim is to get people running in a friendly atmosphere, whilst training for events like the London Marathon, the Great North Run etc. or just for health and fitness.